A coach organizes amateur and professional athletes and teaches them the fundamentals of a sport. He or she trains them to compete as a team or individually. Some coaches recruit new players for college and professional teams. Coaches' median annual earnings were $31,000 in 2015. Most coaches worked for educational institutions, including high schools and colleges. Others work for community organizations. 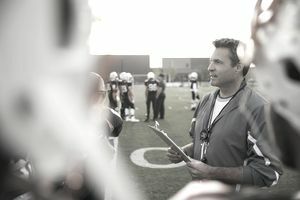 Professional teams also employ coaches. This occupation has a good job outlook. According to the U.S. Bureau of Labor Statistics' predictions, employment will grow as fast as the average for all occupations through 2024. *Note: The US Bureau of Labor Statistics combines wage and employment data for Coaches and Scouts. "Assist in scouting and recruiting activities"
"Monitor individual student-athlete progress to ensure academic eligibility"
"Teach and instruct all aspects of game"
"Promote sportsmanship and foster good character in student athletes"
"Supervise students in practice areas, locker rooms and on buses"
"Encourage student participation and establish rapport"
Since games are often on evenings, weekends, and holidays, coaches can expect to work during hours that many other people do not. Those whose work involves outdoor sports may have to deal with exposure to inclement weather. Coaches who work in high schools are usually teachers and therefore must meet all the qualifications for that occupation, including having a bachelor's degree. Those who work in a college usually need a bachelor's degree too. Degree programs specifically related to coaching include exercise and sports science, physiology, kinesiology, nutrition and fitness, physical education, and sports medicine. Most employers expect those they hire to have participated in the sport they want to coach. High school coaches, particularly those who work in public schools, usually need to be certified. This typically requires training in CPR and first aid, and sometimes in sports safety and coaching fundamentals as well. Some private schools do not require certification. Listening and Speaking: You will need excellent communication skills in order to effectively teach and convey information to your team or individual athletes. Decision Making: During games, you must quickly be able to make decisions. Interpersonal Skills: These "people skills" are essential as they will allow you to relate well to your players. It is likely you will begin your career as an assistant coach, as many who work in this occupation do. After gaining the necessary knowledge and experience, you may eventually become a head coach. If you want to compete at the highest levels of a school sport, you will need substantial experience as a head or assistant coach at a smaller school. Head coaches at larger schools that strive to compete at the highest levels of a sport require substantial experience at another school. Coaching a professional sports team requires years of experience and a winning record in the lower ranks. "Demonstrates organizational ability, and attention to detail and accuracy"
"Be able to give clear and precise directions"
"Must possess good safety awareness and judgment"
"Knowledge of and interest in diverse cultures and populations"
"You need to immerse yourself in the sport and keep up to date on all the latest developments and innovative training methods and techniques"